The CM25 Screw Jack is the baby in the range. With a body size of only 50x60x50mm this compact yet robust screw jack has a load capacity of 2.5kN making it ideally suited for smaller applications such as the adjustment of process equipment and systems. Build a complete system from your desk with our modular range of bevel gearboxes and accessories using our CAD download configurator. With a wide range of sizes, travel speeds and configurations, these high performance, powerful, precision screw jacks are essential if you need to lift, position or hold load. Use our System Builder to determine suitable screw jacks and drive motor parameters tailored to your specific application and complete your system with our range of gearboxes and accessories. When power, high speed, high duty cycle and repetitive positioning is required, our range of ball screw jacks provide the ideal solution. A high efficiency ball screw replaces the standard trapezoidal lifting screw yet accommodates our modular screw jack system thus providing a wide range of sizes, travel speeds and configurations. Our classic J range screw jacks are perfect for heavier industrial applications. Available in a wide range of configurations, the J-Range screw jack can also be modified to suit your individual requirements. Greater loads can be catered for with a bespoke screw jack or screw jack system which can be designed and manufactured to your requirements. Here you can find all the accessories necessary to complete your modular screw jack system such as mounting plates, gearbox shims, drive shafts and couplings. 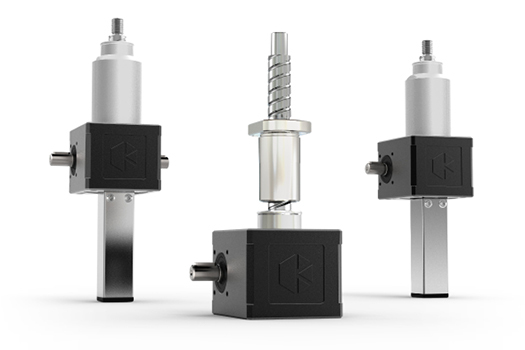 Kelston Actuation Ltd have been designing and manufacturing precision linear actuation products since 1974. We have created an enviable reputation with our worldwide customer base due to our dedication to create modular screw jacks and gear boxes that meet the durability, power and efficiency demands at the right price.